Since the early days of photography, there were photographers financially unable to, or not interested in establishing a portrait studio in a fixed location. These itinerant photographers plowed beach resorts, fairs, places where crowds of people having a good time, possibly not traveling with a camera of their own, would be willing to purchase a portrait. Photographers could do well in such locations. Overhead consisted of equipment, materials and possibly transportation to the locale. Their services were well received as many people enjoy owning a picture recalling their good times. 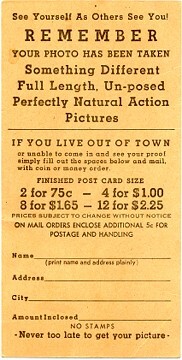 The promotional card shown on this page represents a similar form of marketing by an enterprising photographer. I can imagine how the promotion worked from reading the card. First of all, I think the photographer was not a store employee but was working independently through an arrangement with the store owner. 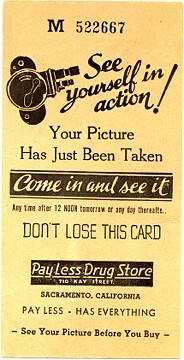 A customer walking through this Sacramento, California Pay Less Drug Store was approached and handed a serial numbered card. The photographer or an assistant explained that a candid photograph was taken of the customer. Further it was explained that because the customer did not know their picture was taken, the likeness would be more natural than a posed portrait. And of course the photographer was a professional, so it would be unlikely a friend or relative of the customer could duplicate these results with the family Kodak (OK, I'm embellishing). It was necessary to develop and print the photo, so customers were asked to return the next day to view and hopefully purchase their portrait. If the customer was "from out of town" or it was not convenient to return the next day they could stop by another day. Or they could mail the card to the store with their payment. The serial number would identify their photo. By mailing the card the customer could avoid embarrassment and high pressure sales tactics. I think that the reason the sale was not "closed" on the spot was that it did not make sense to ask the customer to wait for the processing to be completed. In addition, the photographer's time was best spent taking photographs during store hours. Processing could be done after hours. A benefit to the store of asking customers to return was the possibility of making additional unrelated sales. I have three unredeemed cards in my collection, so it seems not everyone followed up with a purchase. But I imagine many did. I wonder if some people felt their privacy had been invaded? If this was a common reaction, then did the photographer develop a profile of who would be the most receptive and least likely offended, selectively photographing only those who met this profile? I've found the camera used in this promotion. You can view it on the Itinerant Photographer's Candid Camera page.